TORNADO WATCH: The National Weather Service in Jackson has placed Hattiesburg/Forrest County under a tornado watch until 9 p.m.
From the National Weather Service in Jackson: Severe thunderstorms are expected from late this morning through early this evening across the ArkLaMiss region. 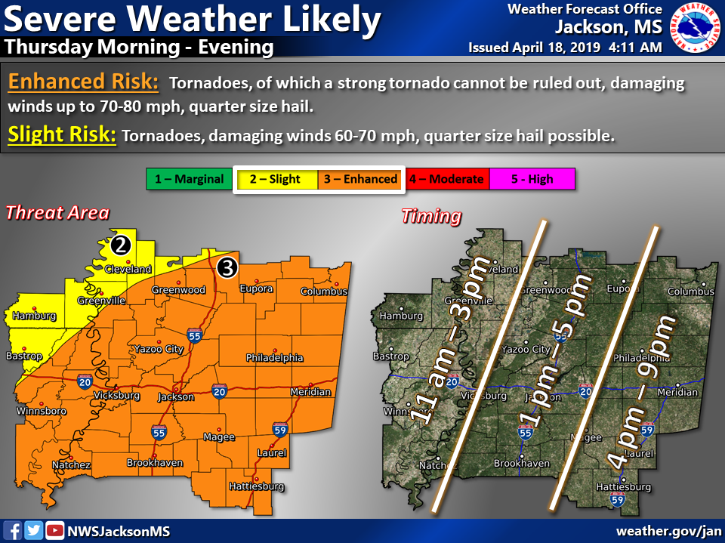 Tornadoes, damaging wind gusts, and hail will all be possible – especially across portions of Northeast Louisiana and Central, West, East, and South Mississippi. 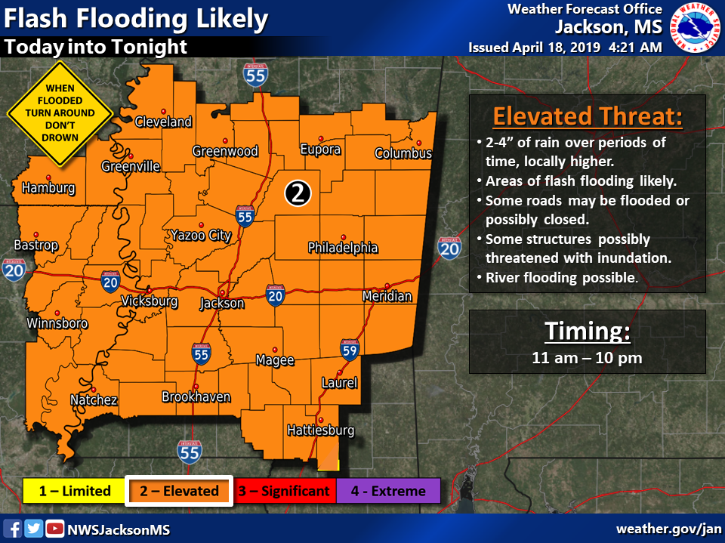 Thunderstorms capable of producing 2 to 4 inches of rainfall, & locally higher amounts, over short periods of time will likely result in flash flooding in some areas across the ArkLaMiss. Please monitor NOAA Weather Radio, and local news and radio outlets today for important weather information. US National Weather Service Jackson Mississippi has placed Hattiesburg/Forrest County under a Tornado Watch until 9 p.m.
A watch means that the weather event COULD happen. A warning means you should take cover now. Touch base with friends and family regarding your emergency plan. Know where you can go if a warning is issued. Be cautious if you are on the road. Obey all barricades and officers who may be directing traffic where water is standing on the road. The 361 Safe Room Shelter is open (946 Sullivan Drive) and sandbags are still available at Forrest County Emergency Management (4080 US Hwy 11). 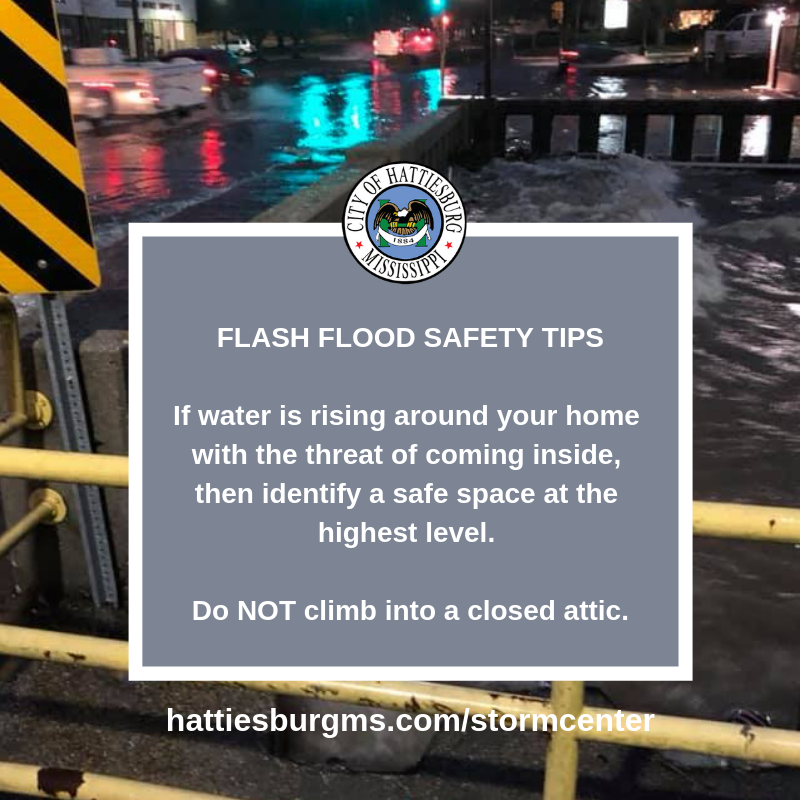 Please stay weather aware, Hattiesburg. Due to the severe weather forecast, city offices will close at 3 p.m.
All response-based & emergency services provided by Public Works, sworn personnel & dispatch for the Hattiesburg Police Department (Official) and Hattiesburg Fire Department will continue operations. Hub City Transit services will also continue until weather conditions don’t allow for such. Sandbags to help with flooding are available at the Emergency Operations Center, located at 4080 US Hwy 11. The forecast for this afternoon hasn’t changed much. The strongest of the storm will still occur between 4 p.m. and 8 p.m., but our area should begin seeing heavy rain around 2 p.m. With it, comes the risk of flash flooding. Please be cautious while driving. Adhere to all traffic barricades and don’t drive through standing water. 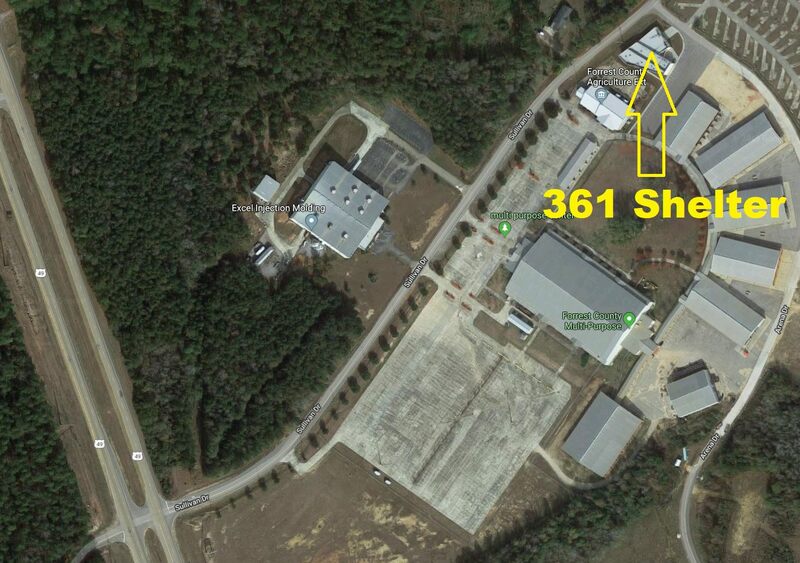 Forrest County Emergency Management will open the 361 Shelter at 2 p.m. It is located at 946 Sullivan Drive (behind the Forrest County Multi-Purpose Center). Lamar County Schools, 11:30 a.m. The University of Southern Mississippi, 1 p.m.
William Carey University, night classes are canceled. The Earth Day Celebration at Town Square Park with the Downtown Hattiesburg Farmers Market has also been postponed until a later date. Prepare for a bumpy day, and stay weather aware. We’ll post updates as we have them. The Hattiesburg area is expected to receive a round of severe weather on Thursday, April 18. The current timeframe is forecasted between 4 p.m. and 8 p.m. On a scale of 1 – 5 for potential, we’re are at a 3 for enhanced risk. This comes with the potential of tornadoes, up to 70 MPH wind and hail. 1️⃣ Know/review your safety plan with your friends/family. Have a safe space to move to should you need it. The timeframe is during drive time and this may affect your plan. 2️⃣ Make sure you have a way to receive weather notifications. Please don’t rely on one source. 4️⃣ Don’t be complacent. While the forecast can always change, we also know what a devastating blow severe weather can have on our community. Don’t underestimate it and make a plan. We’ll continue to watch the forecast and post updates where necessary. Not too much has changed in the forecast for the afternoon/evening. We’re still expected to receive between 3-5 inches of rain in a very short amount of time, with rain continuing to fall through Friday morning. Obey all barricades and signs. Last week we had to close more than 27 roads and intersections throughout the city due to the amount of water crossing the roadways. 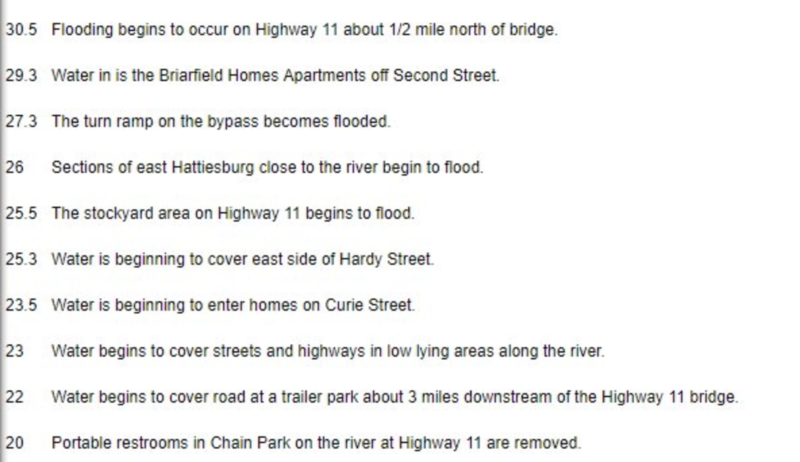 A full list of those roads can be found below (scroll to the bottom and click on Dec. 27 Flooding Event – Click for Archived Updates). We can’t say if we’ll have to do the same again tonight, but we encourage you to take a quick look through the list so that you can prepare for your commute home. If we do have to close roads, a running list will be provided here. Flash flood events already come with conditions that are dangerous. Flash flood events at night are even worse. Do not try to drive across standing water. If the road already has significant damage or a pothole is hidden beneath, you can cause serious damage to your vehicle or it can stall, leaving you stranded. Finally, get home and stay at home. This system could move quickly or it can stall. Either way, the best way to help us and our first responders is to get home and stay there until the system has moved through. If you need sandbags, they can be picked up from Fire Station #1 (810 North Main Street) or the EOC office (4080 Hwy 11) on your way home. Red Cross has opened a shelter at Petal Civic Center (712A South Main St) for any who need to seek shelter from possible flooding. 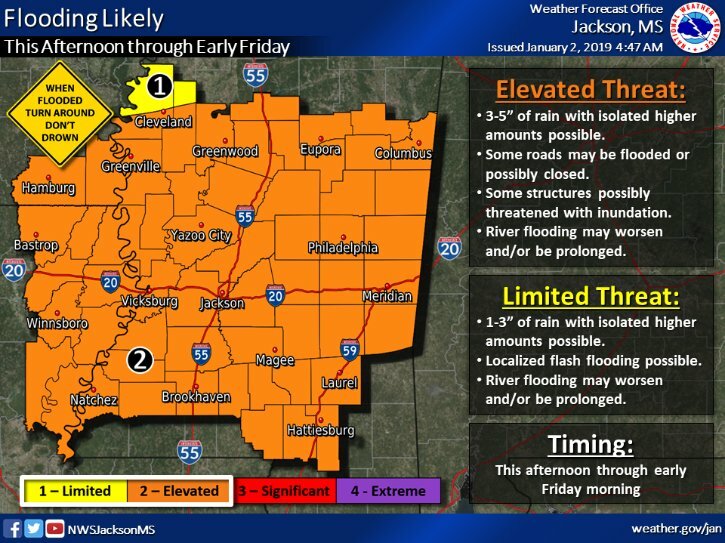 The US National Weather Service Jackson Mississippi is predicting another round of heavy rain beginning Thursday (Jan. 3) and moving through early Friday (Jan. 4) morning. Hattiesburg is forecasted to receive between 3-5 inches of rain. As we saw last week, flash flooding can close many of our roads – quickly. With river/creek levels higher than normal due to last week’s rain, we’re asking everyone to be proactive. To prepare, sandbags can be picked up at Fire Station #1 (810 North Main Street) and at the Forrest County Emergency Management Office (4080 Hwy 11). Red Cross will open at shelter at Petal Civic Center (712A South Main Street). We’ll post periodic updates as we receive them, but please remember to adhere to all cautions and warnings. If you see barricades, obey them. They are out for your safety. Forrest County EMA also still has teams assessing damage due to last week’s flood waters. If you had ANY damage, please contact 601-544-5911. 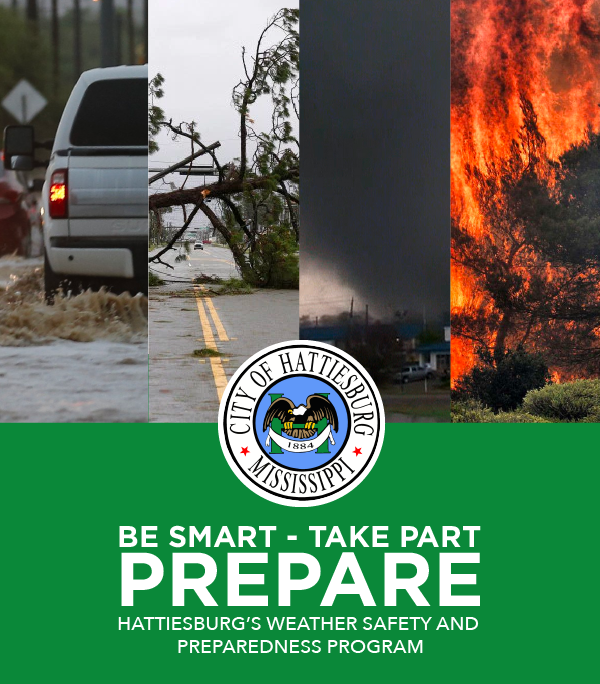 All updates, important information and resources can be located in the City’s online storm center at hattiesburgms.com/stormcenter. According to Forrest County Emergency Management and the US National Weather Service Jackson Mississippi, the Leaf River has crested at 24.62 feet (2 feet lower than forecasted). The river level should slowly continue to fall throughout the remainder of the day. The Red Cross continues to operate a shelter at the Petal Civic Center for those displaced by the flooding. Due to the recent rainfall, Forrest County Emergency Management forecasts that the Leaf River will crest around 26.5 feet tomorrow (Saturday, December 29) around noon. This has the potential to flood neighborhoods in the City of Hattiesburg. We’re asking residents to treat this situation much like the flood in March of 2016. If you saw water in your yard, on your street or in your home in 2016, you will likely see it with this event. The Red Cross shelter is located at the Petal Civic Center, and it is open. It is located at 712A South Main Street in Petal. If you need a ride to the shelter, please call the Action Line at 601-545-4500. It will be staffed throughout the night and into tomorrow. If you would like to pick up sandbags to protect your property against potential flood damage, they are available at Fire Station #1 at 810 North Main Street in Downtown Hattiesburg. Please note, this flood event will be quick. We anticipate that the waters will rise quickly and fall just as quick. Please adhere to all cautions and warnings. Moderate flooding is ongoing on the Leaf River at Hattiesburg. The report below is from the National Weather Service in Jackson. The river is currently at 24.08 ft and is expected to crest Saturday (December 29) at 26.5 ft. Below is a list of flood impacts for respective river levels. After a very long night of flash flood warnings, all have ended. If you have sustained damage to your home or business, please call 601-544-5911 to make a report. This will help Forrest County Emergency Management compile a complete report to submit to MEMA. Due to the continuous rainfall, the US National Weather Service Jackson Mississippi has issued a flood warning for the Leaf River and the Bouie Creek. ▪️ Leaf River to experience moderate flooding. ▪️ Bouie Creek to experience minor flooding. We’re also forecasted to receive more rain throughout the next several days. To assist with flooding, sandbags will be available at Fire Station #1 (810 North Main Street) and Forrest County Emergency Operations Center (4080 US Highway 11) beginning at Noon. All roads are back open. You may still see cones out in a few places where water is still standing on the road. We advise that you continue to use caution during your morning commute. 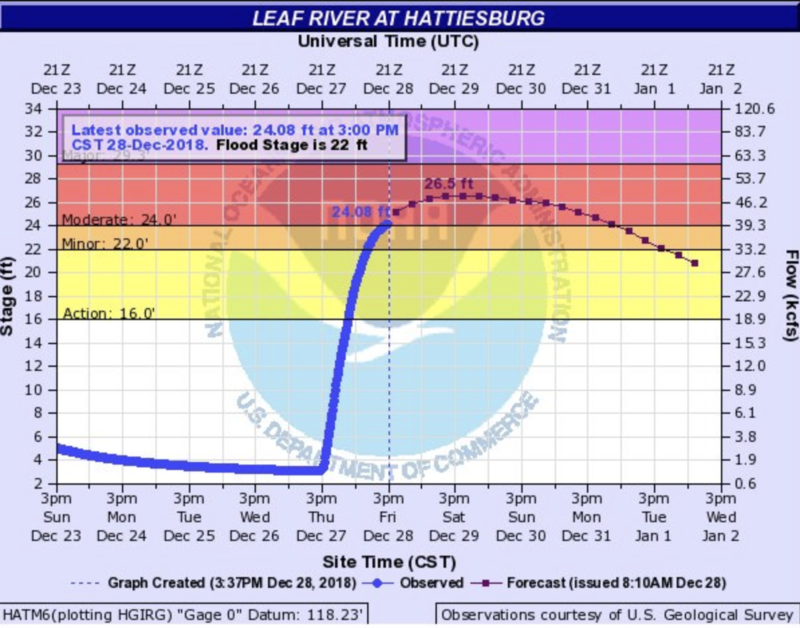 The Leaf River in Hattiesburg is forecast to crest on Sunday, December 30 at 20.5 feet which is below flood stage. Bouie Creek near Hattiesburg is forecast to experience minor flooding through Saturday, December 29. We’ll continue to monitor with Forrest County Emergency Management District and post additional updates when necessary. The rain bands of this system will weaken & gain strength on & off throughout the night. Please follow these safety messages if water is rising around your home. 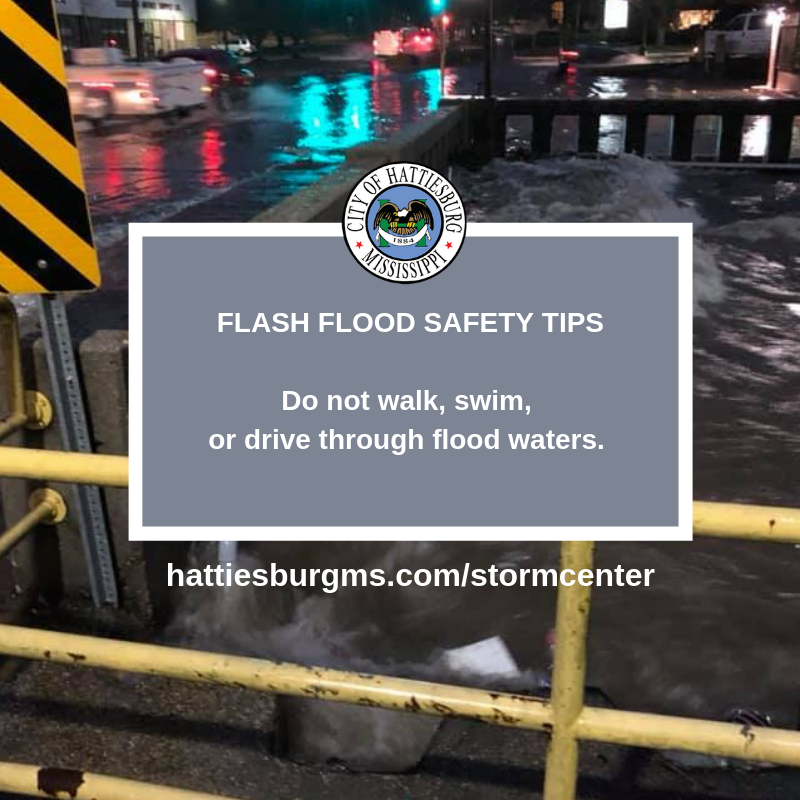 Your phone may have gone off or you may have heard via the news that NWS Jackson upgraded the flash flood warning to a flash flood emergency based on the amount of road closures and continuous rainfall. ▫️ Do not walk, swim, or drive through flood waters. ▫️ Stay off bridges over fast-moving water. Fast-moving water can wash bridges away without warning. ▫️ If your vehicle is trapped in rapidly moving water, then stay inside. If water is rising inside the vehicle, then seek refuge on the roof. ▫️ If water is rising around your home with the threat of coming inside, then identify a safe space at the highest level. Do NOT climb into a closed attic. Please continue to use extreme caution if you are on the road. If you’re at home, stay put. We’ll continue to get more rain throughout the night and into early Friday morning. The latest from US National Weather Service Jackson Mississippiindicates that we may receive up to seven inches total from this event. When we say stay home, we really mean it. Please take care of you and your family by adhering to all warnings and cautions. This thread has garnered the most shares, so we’ll continue to edit it with updates as we receive them. Scroll to the bottom of this post for a running list of road closures and areas to avoid. Lincoln Road at 34th Avenue is now closed. 40th Avenue from Hardy Street to Lincoln Road is now closed. Providence Street is now closed with several stalled vehicles and rising water. HPD is currently on scene. Highway 49 at West Pine is now shutdown due to water crossing the roadway. West 7th Street is now closed from North Street to Main Street due to water crossing the roadway. 1. Exercise caution and patience. 2. Don’t drive through standing water. Even if you *think* you can make it through. And if you’re already at home, stay put until the worst of this system is behind us (please). Not too much has changed for this afternoon’s forecast by the US National Weather Service Jackson Mississippi, except for the shift in timing. Hattiesburg should see the heaviest of the storm between 3 p.m. and 10 p.m.
With it, comes heavy winds, possible tornadoes and an elevated risk for flash flooding. If you are traveling today, please use caution. 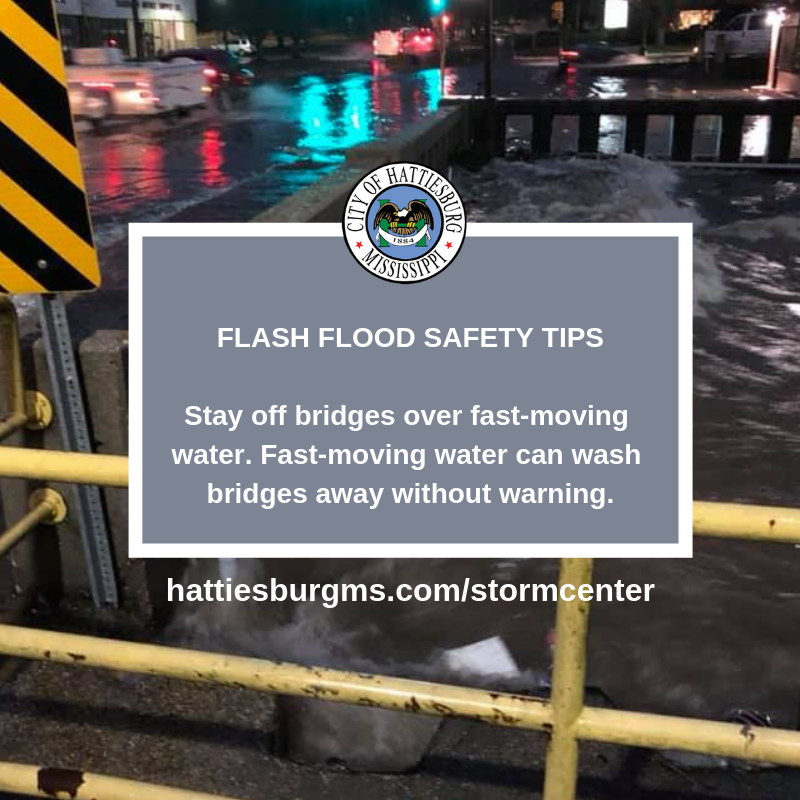 We’ll continue to monitor and post updates accordingly here, on Twitter (Hattiesburg_MS) and on Facebook (CityofHattiesburg). Hey, Hattiesburg. We’re in for a slight risk of severe weather today. This includes damaging winds with the possibility of tornadoes and an elevated risk for flash flooding. If a tornado watch is issued, Forrest County will open the community shelter at 946 Sullivan Drive. We’ll continue to monitor the weather with Forrest County Emergency Management District and update as needed. The roads are wet and snow is beginning to fall in some places. If you HAVE to be on the roads, please exercise great caution while driving. As for now, the system will move past us and will not affect travel. Local schools, including Hattiesburg Public School District, will be closed on Tuesday, Jan. 29. Due to the forecasted conditions, the City will operate a delayed-start for offices at 11 a.m. However, all response-based and emergency services provided by Public Works, sworn personnel and dispatch for the Hattiesburg Police Department and Fire Department will continue daily operations. Pickup services (garbage & recycling) will still occur but will be delayed. Temperatures will drop through the night. The 361 Saferoom Shelter will open at 6 p.m. as a warming shelter and will be open through Wednesday at 10 a.m. Should residents need a ride to the shelter, he or she can call 601-545-4500. Any additional closures we hear of will be posted here. We are preparing materials should they be needed for the cold weather/icy forecast overnight through Tuesday morning. We are currently working with our partners at Forrest County Emergency Management and US National Weather Service Jackson Mississippi to monitor the forecast, and we will follow their lead. We will meet with them this afternoon to discuss further preparations and response. Below is what we do know from our partners at this time. Another update will be provided later this afternoon. Hattiesburg is at a limited threat for potential snowfall between 4 a.m. and 10 a.m. Light accumulation is possible. Travel conditions could become hazardous mainly on bridges due to snow cover and freezing of residual moisture. The Forrest County 361 Saferoom will open this evening as a warming shelter at 6 p.m. and will be open through 10 a.m. on Wednesday, Jan. 30. This forecast will continue to evolve as we get closer. All details will be added here, on Twitter (twitter.com/Hattiesburg_MS) and in our online storm center (hattiesburgms.com/stormcenter). Due to its proximity to the Gulf Coast, the City of Hattiesburg is no stranger to natural disasters. Leading up to, during and after – the City strives to provide concise and real-time updates to all citizens so that they may adequately prepare for what is to come and know where to go and what to do after a storm takes place. Often, we get questions about how the City will communicate and where information can be gathered. The City of Hattiesburg will use every method it can to communicate with those who live and work here to make sure they know what is happening and what they should be doing. In the event that the above methods are unavailable, messages will be physically posted on public buildings or used via loud speakers on police cruisers or other city vehicles will be used to communicate with residents. During major emergencies, City representatives will be staffed at the Forrest County’s Emergency Operations Center.